ING Groep N.V. (NYSE: ING, Euronext: INGA) (known as ING Group) is a financial institution of Dutch origin offering banking, insurance and asset management services. ING stands for Internationale Nederlanden Groep. As of 2007, ING Group served 85 million private, corporate and institutional clients in 50 countries with a workforce of over 130,000 people. It has offices in Australia, Austria, Belgium, Bulgaria, Canada, Chile, Colombia, France, Germany, Hungary, India, Italy, Japan, Mexico, the Netherlands, New Zealand, Peru, Poland, Romania, Singapore, Spain, Taiwan, Turkey, Thailand, UK, and United States. It owns ING Direct, a virtual bank with operations in Australia, Canada, Italy, Spain, UK, U.S., and elsewhere. In the 2008 Forbes Global 2000, which ranks companies based on sales, profit, assets, and market value, ING was the ninth-largest company in the world. Based on its market value in Euros, ING Groups is the world’s 19th largest financial institution. ING offers banking, investments, life insurance and retirement services to individuals and institutional investors. It seeks financial growth both by developing new forms of banking and investment, such as online stock brokerages and online banking, and by investing in high-growth businesses and countries with growing economies. Since its formation in 1990, ING Group has expanded through numerous acquisitions, as well as by opening new branches of its existing businesses. ING Group was created in 1990 by the merger of Nationale-Nederlanden and NMB Postbank Group, two well-established financial institutions in the Nertherlands. Its original parent company was established in 1743. The Postbank was founded in 1881 by the national government of the Netherlands as the Rijkspostspaarbank (National Postal Savings Bank). It was privatized in 1986, together with the postgiro service, as the Postbank. A merger in 1989 with the NMB Bank led to the creation of NMB Postbank Groepis. It has 7.5 million private account holders and is one of the largest providers of financial services in the country. Postbank provides current and savings accounts, loans, mortgages, insurance, investments, and pensions. Unlike most banks, it has no branch offices but operates completely through mail, internet, telephone, and telebanking, although some operations have traditionally been available through post offices. In May 2007, ING Group announced the merger of its ING Bank with the Postbank in the Netherlands to form a single brand ING, debuting in 2009. Nationale-Nederlanden (NN), one of the largest insurance companies in the Netherlands. It was formed in 1962, by a merger of the Assurantie Maatschappij tegen Brandschade De Nederlanden van 1845 (Fire insurance company The Netherlands) and the Nationale Levensverzekerings Bank (National Life Insurance Bank) in response to a falling market share, to forestall the threat of takeovers by other financial institutions. In 1991, after the merger of Nationale-Nederlanden with Postbank, the company changed its name to ING Nationale-Nederlanden. In addition to insurance, the company also offers banking products such as mortgages. The company is headquartered in The Hague and Rotterdam. The Rotterdam headquarters are located in the Gebouw Delftse Poort, the tallest skyscraper in the Netherlands. Aside from these two central offices, the company has no other branches in the Netherlands; instead NN relies on independent agents to sell its insurance products. Nationale-Nederlanden is well known as sponsor of the Dutch national football team. After Nationale-Nederlanden merged with Postbank to form ING Group, the company began a series of acquisitions and expansions, beginning with the opening of its first bank in Romania in 1994. 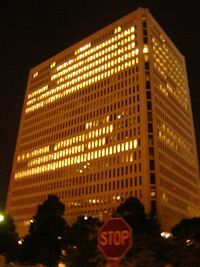 ING opened ING Direct Canada in 1997, and ING Direct USA in 2000. ING Life Bulgaria, a branch of ING Life Hungary, opened in 2006, and in 2008 the group launched retail banking in the Ukraine. ING Group grew rapidly with its acquisitions in Western Europe and North America, including Barings (1995), insurer Equitable of Iowa Companies (1997), Banque Bruxelles Lambert (BBL) of Belgium (1998), BHF-Bank of Germany (1999, sold in 2004), ReliaStar, Aetna Financial Services and Aetna International (2000), DiBa bank of Germany (2002), Allianz Canada (2004), and CitiStreet (2008). It also entered emerging markets with its acquisitions of Bank Śląski of Poland (2000), insurer Seguros Comercial America of Mexico (2000, sold 2008), Oyak bank of Turkey (2007), Landmark Asset Management Company of South Korea (2007), and TMB bank of Thailand (2007). In 2007, ING launched its first variable annuities product for the European market in Spain, and acquired U.S. Web-based stock brokerage firm ShareBuilder. After it announced on October 17, 2008, that it had written off 500 million euros in the third quarter of 2008 from risky loans, following investments in the U.S. of approximately 1.6 billion euros, ING shares lost 27 percent of their value at the Dutch stock exchange. On October 19, 2008, in a move to increase its core Tier 1 capital ratio to 8 percent, ING Group accepted a capital injection plan in which the Dutch government invested €10 billion (US$13.5 billion), in exchange for securities, and veto rights on major ING operations and investments. Wouter Bos, the Dutch finance minister, emphasized that the bank was in a sound financial state and that the government support was intended to fortify the bank so that it could weather the financial crisis. A portion of the €10 billion was allocated to ING Direct, who took over responsibility for £2.5 billion of deposits of 160,000 UK customers with the Icelandic bank Kaupthing Edge, which failed on October 9, 2008. ING concentrates primarily on offering banking, investments, life insurance and retirement services to individuals and institutional investors. It seeks financial growth both by developing new forms of banking and investment products, such as online stock brokerages and online banking, and by investing in high-growth businesses and countries with growing economies. Insurance Europe operates insurance and asset management activities in Europe. Insurance, with a particular emphasis on pensions, is offered primarily in the Netherlands, Belgium, Spain, Greece and Central Europe. Other types of insurance are also offered in the Netherlands and Belgium. Insurance Americas provides insurance, investment, retirement and asset management products and services in North America and Latin America. In the United States, ING is one of the top ten providers of retirement services, based on sales. In Canada, it is the leading property and casualty insurer, based on gross premiums. It is also a leading pension and life insurance company in a number of Latin American countries, including Argentina, Mexico, Chile, Peru, and Brazil. Insurance Asia/Pacific provides life insurance and wealth management in the region. The company is well-established in Australia, Hong Kong, Japan, Malaysia, New Zealand, South Korea and Taiwan; China, India, and Thailand are seen as having potential for future growth as their economies expand. Wholesale Banking conducts global wholesale banking operations, offering a full range of financial products in the Netherlands and Belgium, and more selective products elsewhere. Wholesale Banking also manages ING Real Estate, the world’s largest real estate investment manager based on the value of its assets under management. Retail Banking offers retail banking services in the mature markets of the Netherlands and Belgium, and in the growth markets of Poland, Romania, Turkey, India and China. Private banking is offered in the Netherlands, Belgium, Luxembourg, Switzerland and various countries in Asia, Latin America and Central and Eastern Europe. ING Direct offers savings accounts, mortgages, mutual funds and payment accounts for customers in Australia, Canada, France, Germany and Austria, Italy, Spain, the United Kingdom, and the United States. ING Direct is a virtual bank, offering banking through telephone, internet and automated teller machines without a traditional banking infrastructure, a cost-saving feature that allows it to offer savings accounts with higher interest rates, loans with lower interest rates, and lower service charges on their products than their traditional competitors. ING's headquarters are located near Schiphol airport in Amsterdam. Designed by Roberto Meyer and Jeroen van Schooten, the light-infused building features loggias, patios, and interior gardens. The edifice is supported by posts of 9 to 12 meters (30 to 39ft). It is considered an autonomous building, providing its own power and water supply. A new ING building opened up in Windsor, CT, in the fall of 2007. It is home to many departments and over 2000 employees. ING began sponsoring the Renault Formula One team in Template:F1, and also has a large amount of trackside advertising and race sponsorship deals. From 2007, ING became the title sponsor of the Renault Formula One team. This will continue until at least 2009. In November 2006, ING was announced as the naming rights sponsor of the Australian Grand Prix and Belgian Grand Prix in a three-year deal; the "ING Australian Grand Prix" and "2007 ING Belgian Grand Prix" were the first of 2007 season. ING has also become sponsor of the Hungarian Grand Prix, making it the "ING Magyar Nagydíj." In recent years, ING has been the title sponsor of the New York City Marathon and the San Francisco famous Bay to Breakers. This sponsorship deal will continue until 2010. Over the past several years, the ING Group has come under scrutiny over the ethics of some of their business practices. In October 2005, the National Association of Securities Dealers (NASD), the leading private-sector provider of financial regulatory services in the United States, ordered ING Funds Distributor (IFD) to pay fines of $1.5 million for permitting improper market timing in ING funds and related violations, $1.4 million in restitution to affected mutual funds, and a $25,000 fine and 30-day supervisory suspension on an IFD supervisor. ↑ ING, Michel Tilmant. Retrieved December 19, 2008. ↑ ING, Cor Herkströter. Retrieved December 19, 2008. ↑ ING, John Hele. Retrieved December 19, 2008. ↑ ING, Koos Timmermans. Retrieved December 19, 2008. ↑ DW World, Dutch ING Receives 10 Billion Euros in State Aid. Retrieved December 19, 2008. ↑ BBC News, ING to get Netherlands cash boost. Retrieved December 19, 2008. ↑ ING, ING.com Retrieved December 19, 2008. ↑ U.S. PR Newswire, NASD Orders ING Funds Distributor to Pay $1.5 Million Fine, $1.4 Million in Restitution for Permitting Improper Market Timing; NASD Also Sanctions ING Funds Distributor Supervisor. Retrieved December 29, 2008. Barkema, H.G., S.W. Douma, and B.T.M. Steins Bisschop. Analyse van een fusie: Strategische, financieel-economische en juridische aspecten van de fusie tussen Nationale-Nederlanden en de NMB Postbank Groep. Bedrijfskundige signalementen, nr. 1991/4. Schoonhoven: Academic Service, Economie en Bedrijfskunde. 1992. ISBN 9052610789 (Dutch language). Evans, Richard. 1999. "Dutch Oven—Born in the 1991 merger of Holland's largest insurer and third-largest bank, ING Group remains hot to buy more financial-services firms around the world." Barron's. (p): n.p. Forbes. 2007. The World's 2000 Leading Companies. New York, NY: Forbes. Hatton, David J. W. Facing the Future: Indian Pension Systems. New Delhi: Tata Mc-Graw-Hill Pub. Co., 2007. ISBN 9780070617384. Ibelings, Hans, and Georges Fessy. 2003. ING Group Headquarters, Amsterdam: Meyer en Van Schooten Architecten. Rotterdam: NAi Publishers, 2003. ISBN 9056622765. This page was last modified on 23 January 2018, at 15:56.